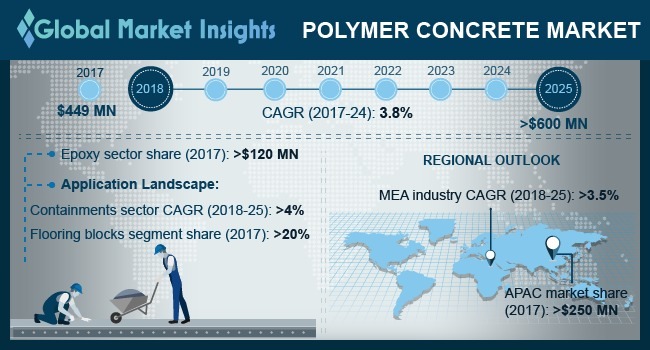 Polymer Concrete Market size is forecast to exceed USD 600 million by 2025; according to a new research report by Global Market Insights, Inc.
Strong growth in construction activities in the emerging economies owing to the improved per capita income of the customers and rising urbanization will positively drive the polymer concrete market in the projected timeframe. Propelling infrastructure construction in Asia Pacific and MEA is continuously on the rise due to the increased government spending. For instance, Navi Mumbai International Airport a USD 2.4 billion project is been built in a great pace since March 2015 in India. Moreover, government of UAE is also spending profoundly to build the USD 24 billion worth Khalifa Port. Similar ongoing and future infrastructural projects in various emerging nations will profusely augment the polymer concrete market size in the coming years. Furthermore, product properties such as high strength, durability, heat resistance and better adhesion will help in driving the modified concrete market in the near future. High polymer prices may prove to become a obstacle in the growth of the polymer concrete market. Few resins, fibers or acrylates that are added to the concrete to provide additional properties may face availability issues sometimes, which increases the cost of these polymers. Nevertheless, rising building and construction activities and the continuous product innovation is creating a great surge for the modified concrete market by 2025. Polymer impregnated concrete (PIC) accounted close to 15% of the overall market size in 2017. PIC generally contains acrylates replacing the cement. These acrylates improve the strength and durability of hardened concrete, increases its impermeability & chemical resistance and improves its bond characteristics. Moreover, the main property of PIC to correct the moisture content in the hardened concrete and to fill the air voids in the concrete will positively boost the polymer concrete market size in the projected timeframe. Latex in polymer concrete market will register a CAGR over 2.5% by 2025. Latex are another important polymer that is mixed in PIC. Latex holds the maximum adhesion properties than any other aforementioned polymers. The latex and concrete mixture develops higher bonding power, higher strength, improved resistance to chloride penetration or any other chemical attacks. Additionally, the polymer film created in the concrete through latex maintain a high level of internal moisture in the concrete which would propel the modified concrete market in the forecast period. Polymer concrete market size for application in flooring blocks is registers more than 20% of the total industry size in 2017. Flooring blocks are cost competitive and the most popular form of flooring process, this procedure of flooring offers low cost and saves a lot of time. Polymer concretes in flooring blocks makes it swift and cost effective without the need for any expensive plant or specialist skilled labor. Many countries in Middle East are investing heavily on high end buildings and public infrastructures that are requiring polymer concrete flooring blocks for high strength and low-cost flooring which will increase the polymer concrete market size copiously in the forecast timeperiod. Middle East & Africa polymer concrete market size is likely to grow at a CAGR of over 3.5% by 2025. Government in the region is making substantial investments to improve their complete infrastructure. For instance, the construction spending by the government in the region registers around 67%. These are high end infrastructural projects worth over USD 1 billion which instead will surge the polymer concrete market size in the projected timeframe. Also, growing public-private partnership ventures are expected to profuse the investments for the regional construction industry in the expected timespan. Polymer concrete market share is competitive, with several key players accounting for the total industry size. The major players include ACO Group of Companies, Forte Composites Inc, BASF, Bouygues S.A., Kwik Bond Polymers, Wacker Chemie AG, Sika, Crown Polymers, Fosroc, Mapei, ErgonArmor and SAUEREISEN.